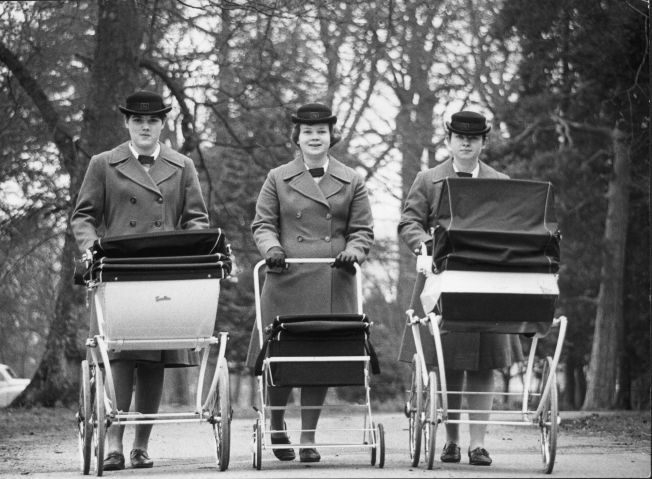 1971: Three Norland nannies, left to right, Christine Garner, Rosemarie Coley and Jennifer Good pushing prams in the park. All sorts of sectors are hurting in these recessiony times, but those who provide luxury goods and services are in an especially tricky pickle. Take, for instance, nannies: The ultrariche aren't going to stoop to changing diapers anytime soon (though as a recent Vanity Fair article notes, some might be downgrading their maids to four days a week instead of five), but what about the yuppies? Hiring someone to Mary Poppins your spawn used to be something you just factored into your monthly budget, along with iTunes downloads and TiVO; but now - especially if one parent has been laid off and has plenty of time to make grilled cheese and sing "The Wheels on the Bus" ninety times in a row - corners are being cut. But what about the nannies? Well, as you might expect, the poor dears are finding themselves duking it out for a dwindling number of positions. Enter Kimberly Castro, who pens the Luxe Life blog over at U.S. News and World Report, with her handy, career-saving list of "14 Ways Nannies Can Market Themselves." Some of the groundbreaking tips: Having proof to work legally, references, and knowledge of CPR and first aid. Take that, other nannies! Don't use your nanny stint as a stepping stone to the U.S. senate. Don't be a closet psycho who breastfeeds your charge in secret and then tries to murder your employer by emptying out all her asthma inhalers. Don't pose as a Scottish Barbara Bush lookalike to get the job so you can be closer to your kids after your wife kicks you out for being a manic, unemployed freeloader. Don't hint at your plans to write a bestselling tell-all after you're fired -- even if you're going to be played by Scarlett Johannson.